Fittings are CAD-plated and precision machined. Swivel feature makes connecting hoses a breeze. Good for tight spots with a low profile. 8021560 is rated 5.0 out of 5 by 3. Rated 5 out of 5 by G in San Diego from Good, right and QUICK! The ones I found elsewhere were too expensive, and the shipping was as much as the parts! 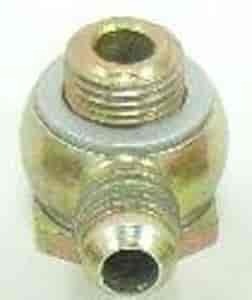 Shoulda gone right to JEGS, they had the exact same banjo fittings and shipping was FREE. PLUS I got them in just a coupla days- NO complaints here! Thanks again for saving my bacon! This fitting is used on a rack and pinion.